Continuing Education is one of those things that sounds like mandatory staff training. However, a wise man once said, “Find something you love to do and you'll never have to work a day in your life.” (Harvey MacKay? Confucius? I don't think they talked about “jobs” back in Confucius' time, but the internet mostly gives him the credit). Well, there is a way to love continuing education and to make it not seem like work. ...and it is fabulous. I actually go to sleep looking forward to waking up and reading. What's the secret? My self-created course is a collection of my favorite blogs on language education, language technology, and linguistics. Yours could be different. If you're interested, here is how you can get started. If you don't already have a Google account, you need to make one. I'm pretty sure you can use a non-Gmail email address for it, though. On the left-hand side of the reader, you can see the “All Items” heading. Once that section is expanded, you will see “Browse for Items.” When you click it, it will open a page that helps you find relevant feeds. 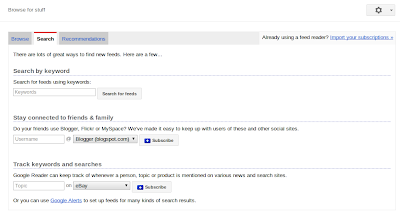 You can browse pre-packaged “bundles” (groups of blogs), search for topics, people, or blogs, or look at recommendations based on the blogs you already subscribe to. If you find ones that you like, click the “Subscribe” button (with the blue +). Click the button, and a query window will come down. In the field, either type the name of a specific blog, a topic, or any key word that you are looking for. 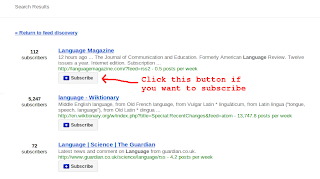 The search term will bring up a page of results, and if you find ones that you like, you can click the “Subscribe” button (with the blue +). 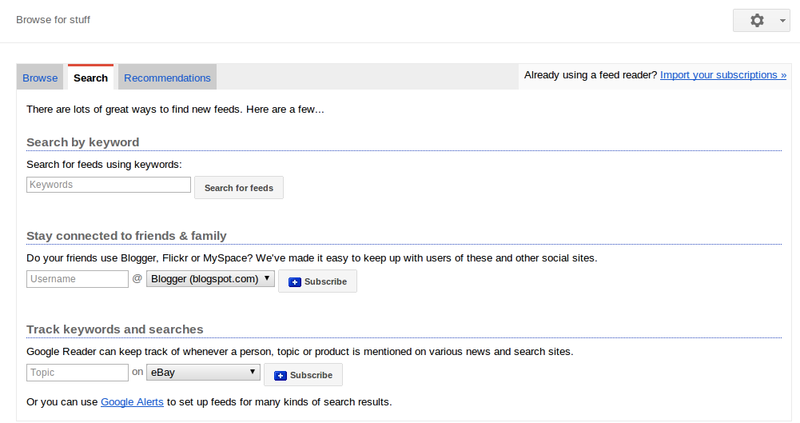 If you aren't getting the results you want through the search options inside Google Reader, it is also possible to go to any search engine and type in a query like “Blogs about ….” You can peruse the results, and if you find ones you like, you can return to Google Reader and use option 1 or 2 to add the blog. Also, many blogs have a “Feed Subscription” button (orange with curvy lines), and you can click that in order to start the adding process. Now that you're all set up, you can click on “All Items” to start reading the blog posts in the order they were published OR you can click on the name of the blog in the side column (under subscriptions heading) to read them blog-by-blog. Don't subscribe to too many blog feeds. It gets overwhelming to have 1,000 unread items in your feed every morning, and chances are, you will miss the good blog posts because they are burried under the not-so-important ones. 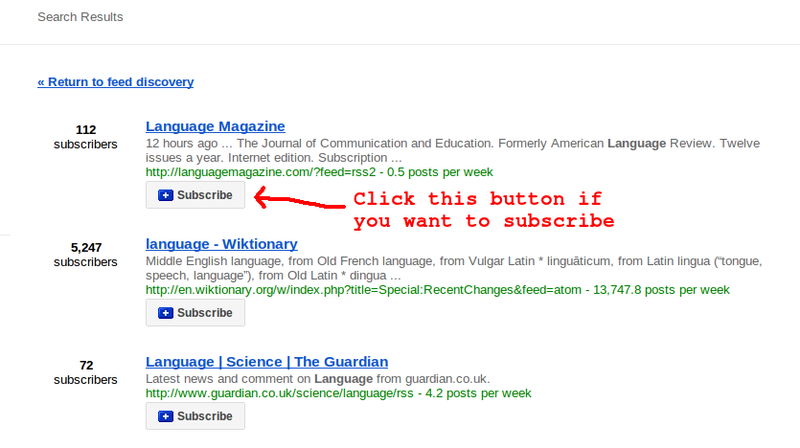 If you ever see the orange RSS feed icon on a blog you really like, you can also click it, and sign up that way. Also, many browsers have an RSS add-on that puts an icon to subscribe (that you can click) in the address bar. 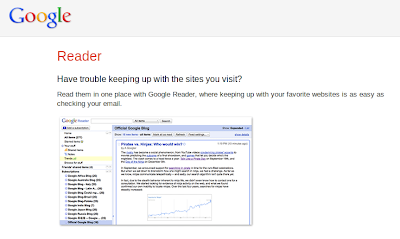 Make Reader.google.com your homepage. It makes it easier to get in the habit of reading the feeds when it is the first thing you see whe you start the internet browser. 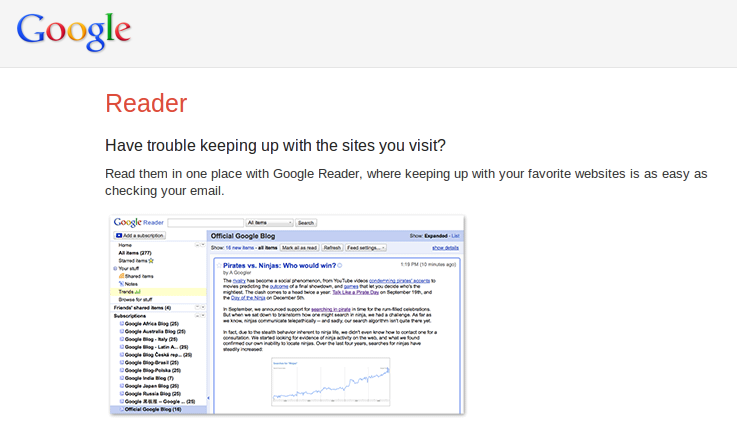 Anyway, I hope this is helpful for those of you not already using a reader. If you have any questions, I'm more than happy to try to help!